The McAllen High girls soccer team celebrates with the trophy after beating Austin Lake Travis in the Class 6A Region IV final on Saturday at Blossom Athletic Center in San Antonio. 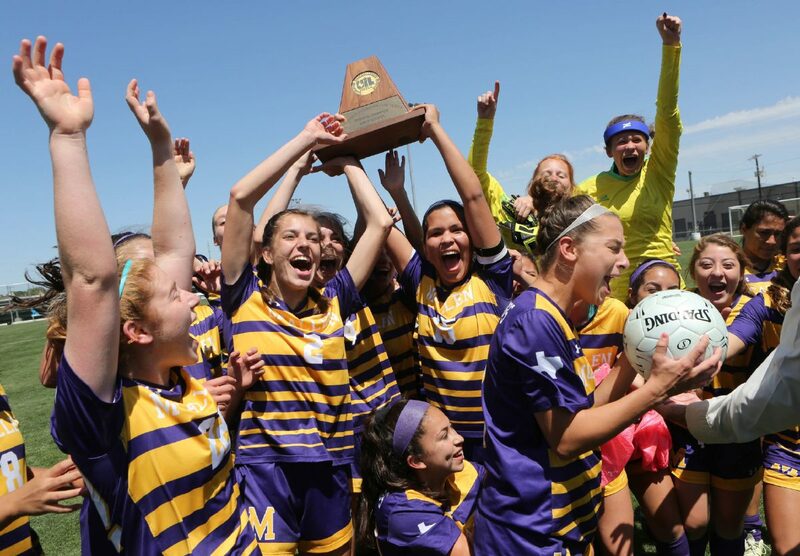 McHi became the first Valley girls team in history to advance to the UIL state tournament. 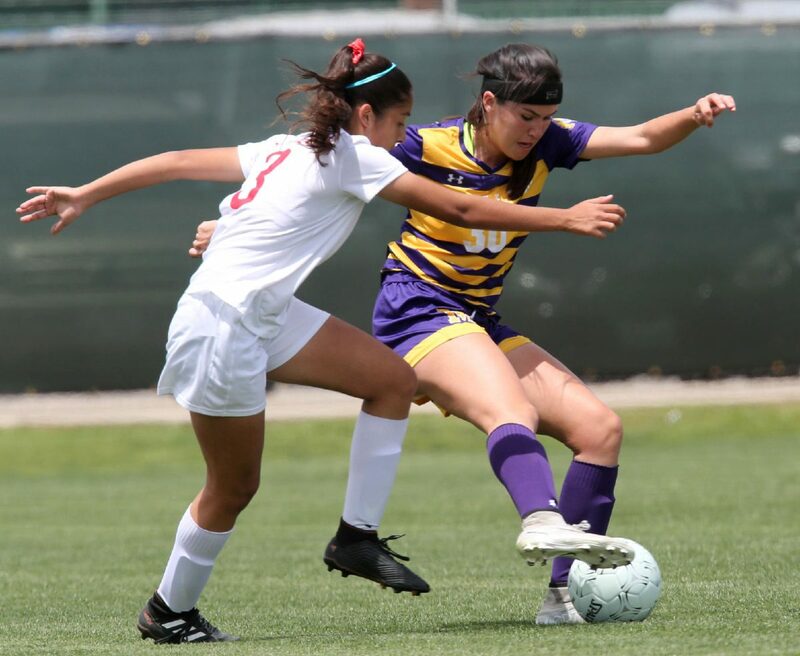 SAN ANTONIO — One late goal was all the McAllen High Bulldogs needed to punch their ticket as the first Rio Grande Valley girls soccer team in history to qualify for the state tournament. 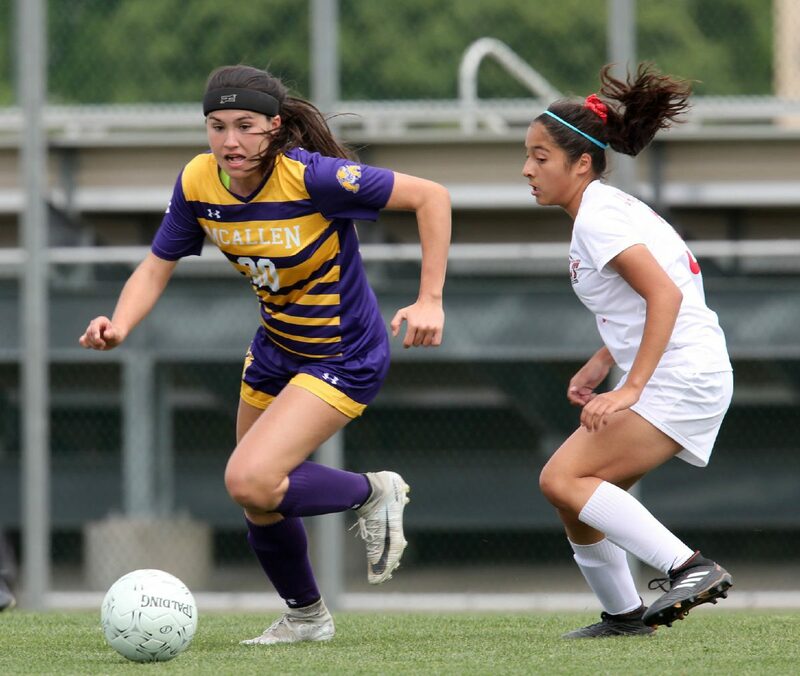 Ava Alaniz put the shot home in McHi’s 1-0 win over Austin Lake Travis in the Class 6A Region IV final on Saturday at the Blossom Athletic Center. Alaniz lost her breath jumping around with her team when the final buzzer sounded, then again when the Bulldogs were handed the regional trophy. The goal she’ll never forget was still fresh on her mind. 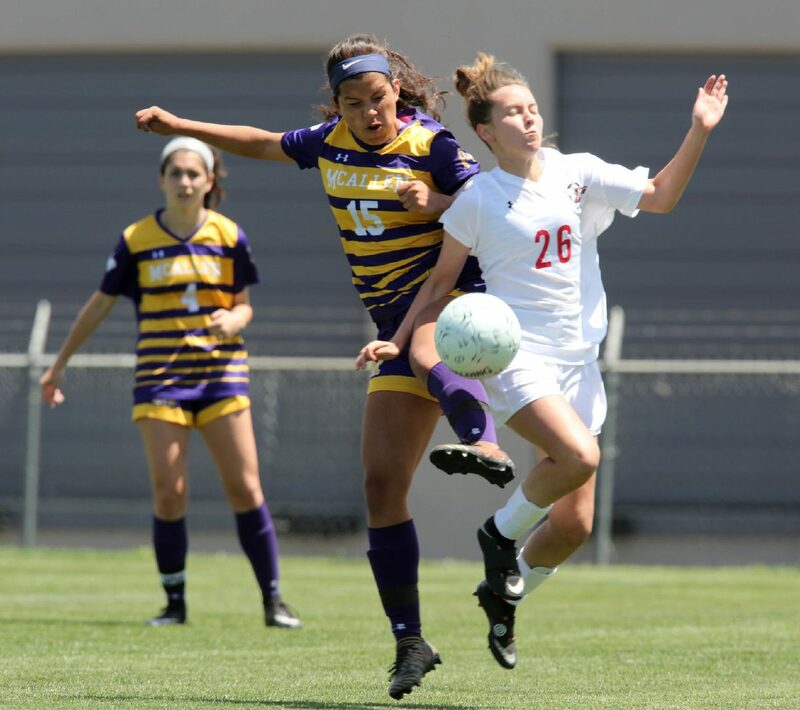 Henderson, who sent the lob pass that put Alaniz one-on-one with the goalie, said the moment was special, even knowing the Bulldogs had to defend for a few more minutes. McAllen High's Jackelyn Lemus knocks Austin Lake Travis' Kaylyn Burnett off the ball during the second half of their Class 6A regional final match Saturday, April 14, 2018, at Blossom Athletic Center in San Antonio. McAllen High won the match 1-0. 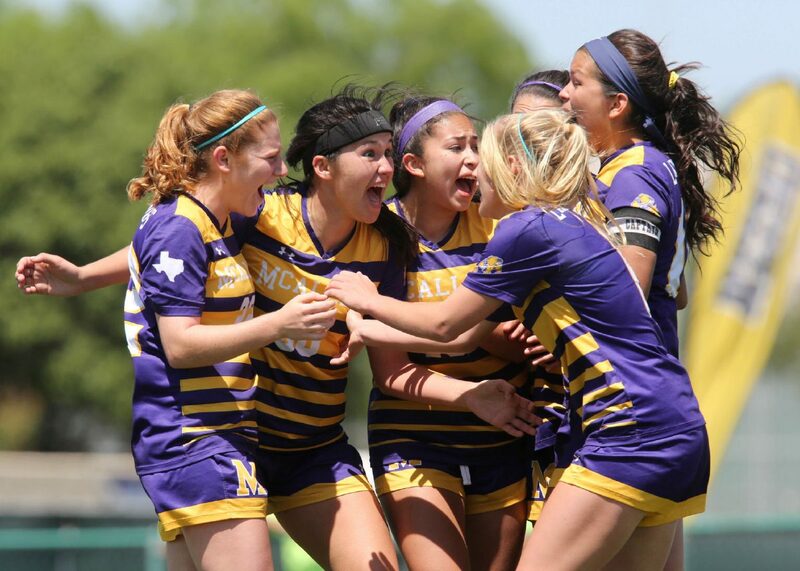 McAllen High's Emily Gurwitz, left, celebrates a game-winning goal scored by Ava Alaniz, second from left, against Austin Lake Travis during the second half of their Class 6A regional final match Saturday, April 14, 2018, at Blossom Athletic Center in San Antonio. 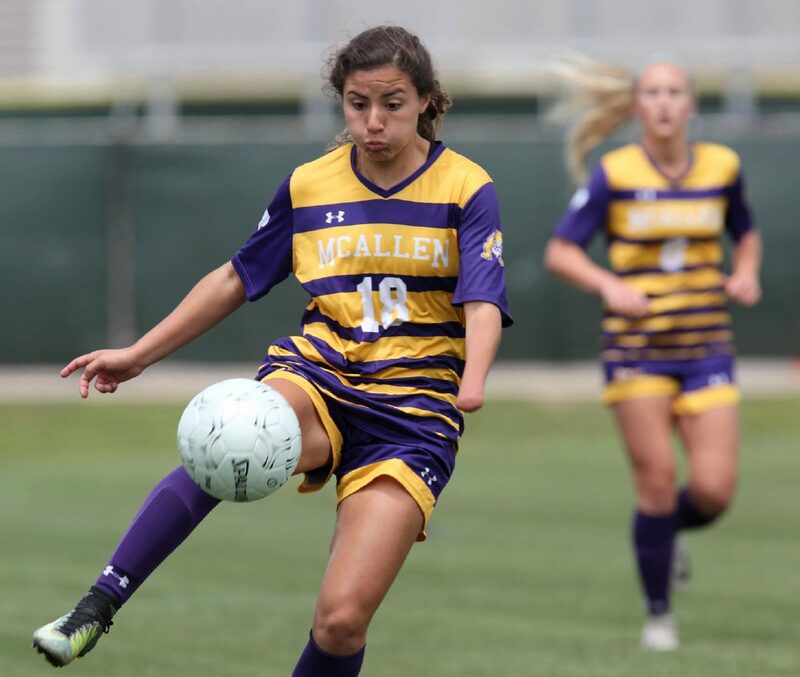 Gurwitz is one of several students on McAllen High soccer team who are students of the International Baccalaureate program at the Lamar Acadamy. McAllen High's Ava Alaniz advances the ball as Austin Lake Travis' Alana Clark defends during the first half of their Class 6A regional final match Saturday, April 14, 2018, at Blossom Athletic Center in San Antonio. McAllen High won the match 1-0. McAllen High's Sophia Soto is knocked down by Austin Lake Travis' trinity Clark during the first half of their Class 6A regional final match Saturday, April 14, 2018, at Blossom Athletic Center in San Antonio. McAllen High won the match 1-0. 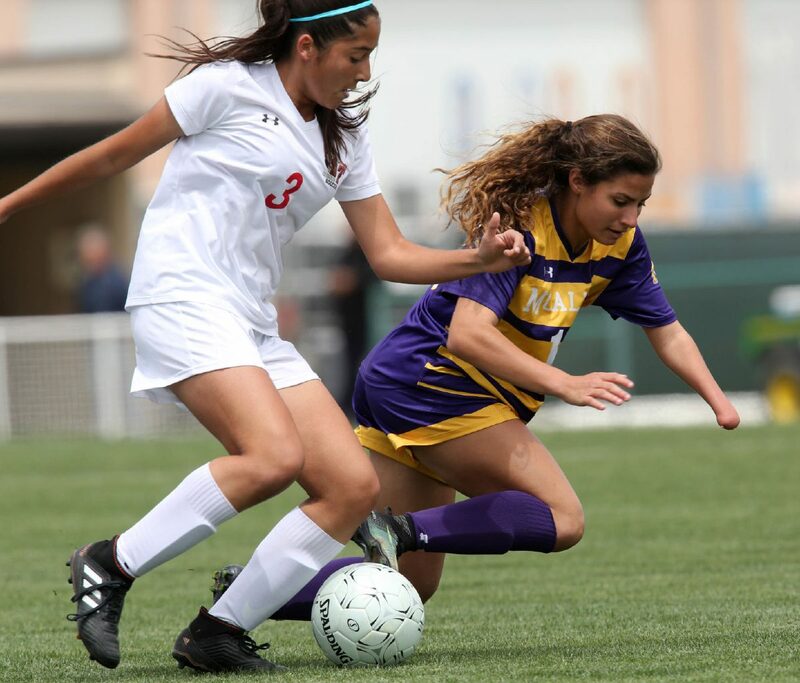 McAllen High's Ava Alaniz tries to move past Austin Lake Travis' Trinity Clark during the first half of their Class 6A regional final match Saturday, April 14, 2018, at Blossom Athletic Center in San Antonio. McAllen High won the match 1-0. McAllen High's Ava Alaniz tries to get past Austin Lake Travis' Alana Clark during the first half of their Class 6A regional final match Saturday, April 14, 2018, at Blossom Athletic Center in San Antonio. McAllen High won the match 1-0. McAllen High's Sophia Soto chases after the ball against Austin Lake Travis during the first half of their Class 6A regional final match Saturday, April 14, 2018, at Blossom Athletic Center in San Antonio. Sophia and her two team-mates sisters, Andrea and Giselle, are students of the International Baccalaureate program at the Lamar Acadamy. McAllen High's Ava Alaniz keeps the ball from Austin Lake Travis' Trinity Clark during the first half of their Class 6A regional final match Saturday, April 14, 2018, at Blossom Athletic Center in San Antonio. McAllen High won the match 1-0. McAllen High's Jackelyn Lemus moves the ball up the field against Austin Lake Travis during the first half of their Class 6A regional final match Saturday, April 14, 2018, at Blossom Athletic Center in San Antonio. McAllen High won the match 1-0. For nearly 78 minutes, both teams fought in an attempt to put the first ball past the opposing keeper. Strong play by defensive players on both sides made sure that wouldn’t be an easy task. 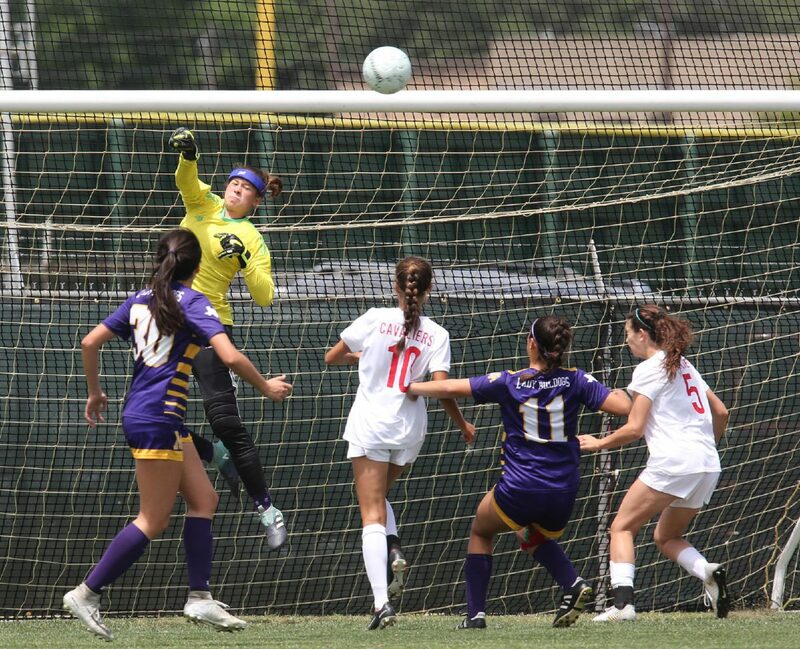 McHi sophomore goalkeeper Lexi Gonzalez made 12 saves in the victory. 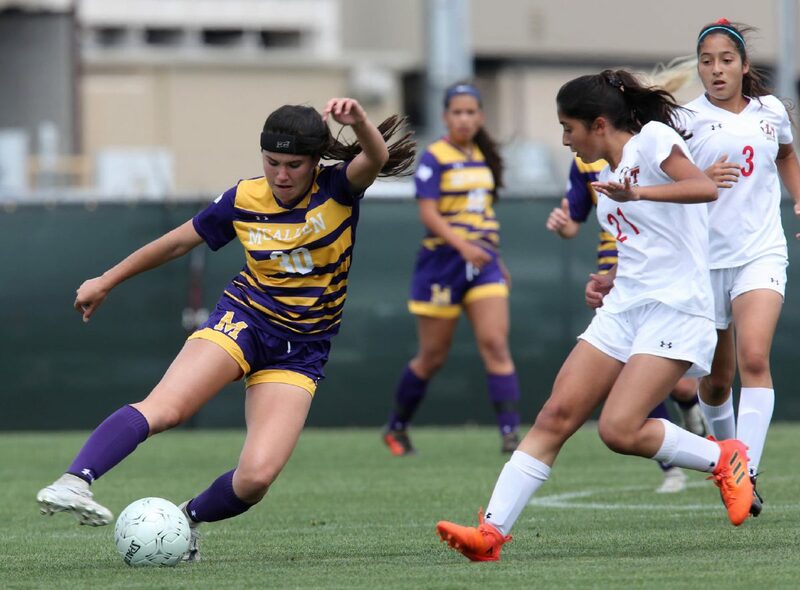 She ended the weekend with only one goal allowed between McHi’s wins against San Antonio Johnson in Friday’s regional semifinal and Lake Travis on Saturday. Gonzalez said the shooting of the Cavaliers was the best she’d seen. “I just did my best to get everything out, no matter how much it took,” Gonzalez said. Her MVP-type performance included tipping over the crossbar three balls that were postmarked for the top shelf. 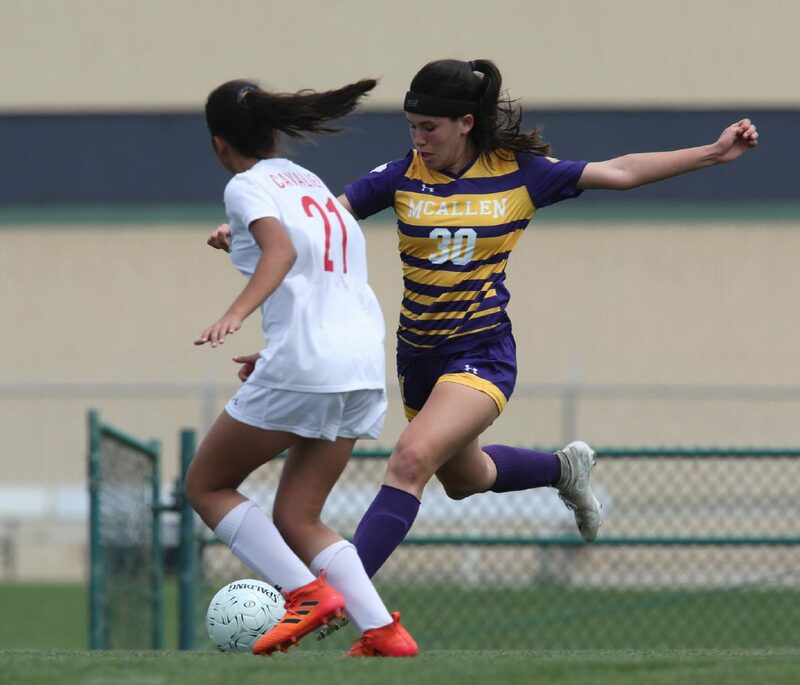 Her saves and the play of McHi’s defense shut out a Lake Travis team that put five goals past Brownsville Rivera on Friday to qualify for the regional final. 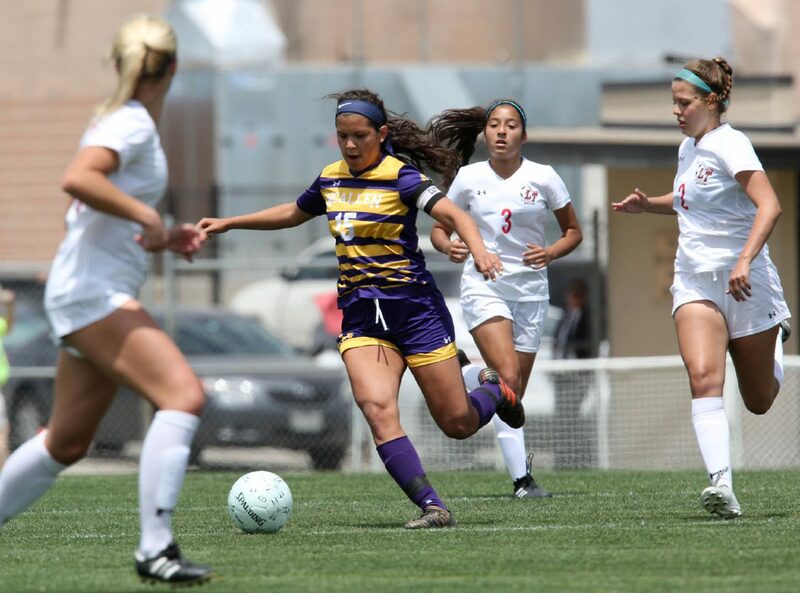 Victoria Sola, Emily Gurwitz, Rylie Flores and Zoe Flores were again praised by McHi coach Pat Arney after the game for their ability to shut down a strong opponent. When the winning goal went in, Gonzalez dropped to her knees in joy. Westyn Henderson was a difference-maker again for the Bulldogs. In Saturday’s final, she combined with teammates Alaniz and Sophia Soto to look threatening on many occasions. The wind was a factor in the match. Sustained winds blew at 17 mph at kickoff, and gusts exceeded 20 mph. 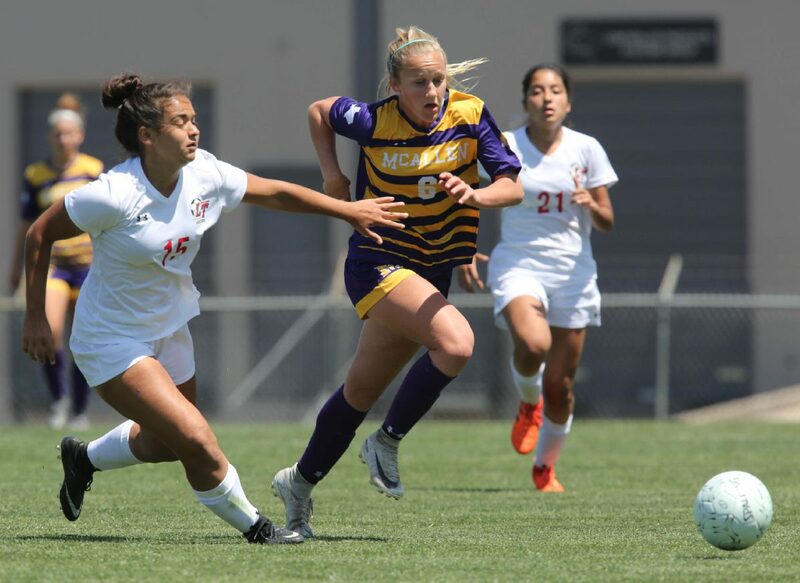 Though the Bulldogs didn’t score with the wind at their back in the first half, they worked their counterattack to keep the Cavaliers honest. Both teams had glimpses of offense, but the defenses stood tall. For Arney, who has been the Bulldogs coach since the program started, Saturday was a long time coming. In 2007, Arney’s group reached the regional final but was unable to leap the fifth-round hurdle. That season was the only other time McHi advanced past the fourth round. McAllen High will play in the UIL Class 6A state semifinals on Friday. The UIL will announce the Bulldogs’ first opponent when the tournament bracket is seeded on Sunday.